1. Wombats are native to Tasmania and Australia and they are only found in these two places today. 2. The wombat is a very shy and timid creature. They are also nocturnal. This makes it very difficult to study them within their natural habitat. 3. Wombats can measure up to 39 inches long. Their tail adds very little to their length because the tail is nothing more than a little nub on their backside. 4. Predators do not pose much of a danger to wombats. This is because the wombat’s body is mostly made up of tough cartilage that is difficult to bite into. 5. Wombats have a pouch that is backwards. This helps prevent it from getting filled with dirt as they dig holes. 6. A wombat typically weighs anywhere between 44 and 77 pounds on average. 7. Wombats are solitary mammals, but mothers will spend time with her offspring to care for them and teach them survival techniques for when they are older. Some species of wombats also spend time in colonies with other wombats. 8. If a wombat feels that it is threatened, it can run as fast as 25 miles per hour to get away from the threat. They can only keep up this speed for a very short period of time, though. 9. To escape a potential predator, wombats can dig burrows quickly where they can hide. They will put their head in the hold and leave their backside sticking out since predators cannot really harm that area due to the large amount of thick cartilage. 10. Wombats are herbivores. This means that they eat plants, grasses, bark, and roots. Their teeth are very similar to rodents, which helps them chew through the thicker vegetation. 11. Due to their slow metabolism, it could take a wombat several days to digest its food. 12. The wombat’s gestation period is approximately 21 to 28 days, or three to four weeks. Females give birth to one wombat at a time. Once born, the baby wombat goes into the mother’s pouch for a period of six months. 13. Once the wombat leaves the mother’s pouch, they stay with her for another six or seven months. After that, they begin to go out on their own. 14. Wombats generally live for about 5 years in the wild. In captivity, they have been known to live as long as 26 years, but that is not typical. 15. Female wombats are able to give birth when they reach about 18 months. 16. There are three basic varieties of wombat. They are the northern hairy-nosed wombat, the southern hairy-nosed wombat, and the common wombat. 17. 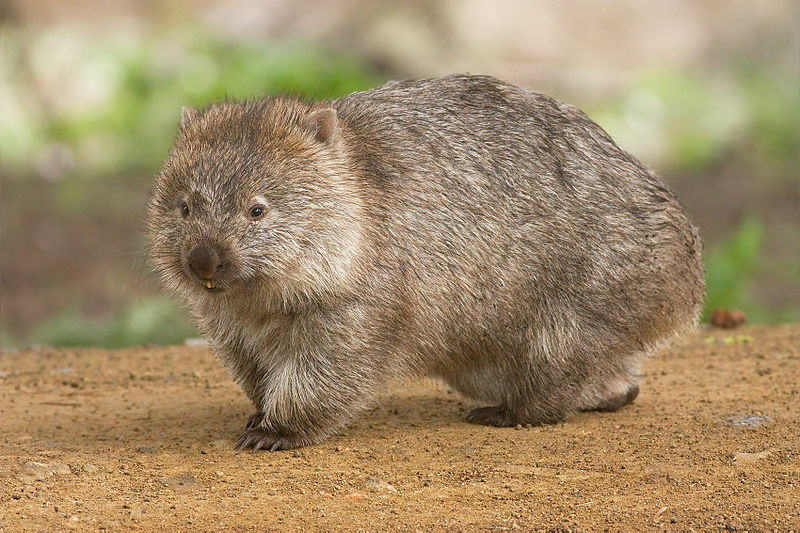 Wombats are hunted for a variety of reasons, including their fur, for sport, and because they have a tendency to destroy fields and crops with their burrowing activities. 18. A wombat’s burrow can be as long as 100 feet. 19. Wombats use growling and head shaking to scare other animals out of their territory and away from their food. 20. There are several places where you can see wombats, including Kosciuszko National Park, Blue Mountains National Park and other parks throughout southern Australia. 21. Wombats can be aggressive and begin scratching and biting if they feel threatened. 22. A group of wombats is either called a colony or a mob. 23. The northern hairy-nosed wombat is considered “critically endangered” by the International Union for Conservation of Nature, or IUCN. This means that they are at extreme risk for extinction if steps are not taken to conserve the population. 24. Wombat colors range from gray to black to a sandy brown. 25. When standing on their hind legs, wombats can reach heights ranging from 28 inches to 47 inches.